Picture - Wellington B Mark IA. The geodesic construction is evident through the perspex windows along the aircraft's side. The Vickers Wellington was a British twin-engine, long range medium bomber designed in the mid-1930s at Brooklands in Weybridge, Surrey, by Vickers-Armstrongs' Chief Designer, R. K. Pierson. It was widely used as a night bomber in the early years of the Second World War, before being displaced as a bomber by the larger four-engine "heavies" such as the Avro Lancaster. The Wellington continued to serve throughout the war in other duties, particularly as an anti-submarine aircraft. It was the only British bomber to be produced for the entire duration of the war. The Wellington was popularly known as the Wimpy by service personnel, after J. Wellington Wimpy from the Popeye cartoons and a Wellington "B for Bertie" had a starring role in the 1942 Oscar-nominated Powell and Pressburger film One of Our Aircraft Is Missing. The Wellington was one of two bombers named after Arthur Wellesley, 1st Duke of Wellington, the other being the Vickers Wellesley. The Wellington used a geodesic construction method, which had been devised by Barnes Wallis inspired by his work on airships, and had previously been used to build the single-engine Wellesley light bomber. The fuselage was built up from 1650 elements, consisting of aluminium alloy (duralumin) W-beams that were formed into a large framework. Wooden battens were screwed onto the aluminium, and these were covered with Irish linen, which, once treated with many layers of dope, formed the outer skin of the aircraft. The metal lattice gave the structure tremendous strength, because any one of the stringers could support some of the weight from even the opposite side of the aircraft. Blowing out one side's beams would still leave the aircraft as a whole intact; as a result, Wellingtons with huge areas of framework missing continued to return home when other types would not have survived; the dramatic effect was enhanced by the doped fabric skin burning off, leaving the naked frames exposed (see photo). Picture - The Merlin-engined Wellington Mark II. This aircraft belongs to No. 104 Sqn.. Notice the criss-cross geodesic construction through the perspex fuselage panels. In one case as a result of an fire in the wing caused by battle damage a Wellington co-pilot was forced to climb out of the aircraft while in flight kicking holes in the doped fabric for foot and hand holds and physically smother the burning upper wing covering. The aircraft returned home safely and the airman concerned, Sergent James Allen Ward was awarded the Victoria Cross for his actions. The geodesic structure also gave a very strong but light structure for its large size, which gave the Wellington a load and range to power ratio advantage over similar aircraft, without sacrificing robustness or protective devices such as armour plate or self-sealing fuel tanks. However, the construction system also had a distinct disadvantage in that it took considerably longer to build a Wellington than other designs using monocoque construction techniques. Also, it was difficult to cut holes into the fuselage to provide additional access or equipment fixtures. The Leigh light, for instance, was deployed through the mounting for the absent FN9 ventral turret. Nevertheless, in the late 1930s Vickers succeeded in building Wellingtons at a rate of one a day at Weybridge and 50 a month at the Chester factory (located at Broughton in North Wales). Peak wartime production in 1942 saw monthly rates of 70 achieved at Weybridge, 130 at Broughton and 102 at Blackpool. In October 1943 the Ministry of Information released a film showing workers at the Broughton factory assembling one aircraft (aircraft build number LN514) in a "record" 23 hours 48 minutes, although substantial pre-assembly was done to make this record time achievable. Picture - Wellington Mark X HE239 of No.428 Sqn. RCAF, illustrating the geodesic construction and the level of punishment it could absorb while maintaining integrity and airworthiness. The Wellington went through a total of 16 variants during its production life plus a further two training conversions after the war. The prototype serial K4049 designed to satisfy Ministry Specification B.9/32, first flew as a Type 271 (and initially named Crecy) from Brooklands on 15 June 1936 with chief test pilot Joseph Summers as pilot. After many changes to the design, it was accepted on 15 August 1936 for production with the name Wellington. The first model was the Wellington Mark I, powered by a pair of 1,050 hp (780 kW) Bristol Pegasus engines, of which 180 were built, 150 for the Royal Air Force and 30 for the Royal New Zealand Air Force (which were transferred to the RAF on the outbreak of war and used by 75 Squadron). The Mark I first entered service with No. 9 Squadron RAF in October 1938. Improvements to the turrets resulted in 183 Mark IA Wellingtons, which equipped the RAF Bomber Command heavy bomber squadrons at the outbreak of war. The Wellington was initially outnumbered by its twin-engine contemporaries, the Handley Page Hampden and the Armstrong Whitworth Whitley, but ultimately outlasted them in productive service. The number of Wellingtons built totalled 11,461 of all versions, the last of which was rolled out on 13 October 1945. The first RAF bombing attack of the war was made by Wellingtons of No. 9 and No. 149 Squadrons, along with Bristol Blenheims, on German shipping at Brunsbx�ttel on 4 September 1939. During this raid, the two Wellingtons became the first aircraft shot down on the Western Front. Numbers 9, 37 and 149 Squadrons saw action on 18 December 1939 on a mission against German shipping on the Schillig Roads and Wilhelmshaven. Luftwaffe fighters destroyed 12 of the bombers and badly damaged three others; thus highlighting the aircraft's vulnerability to attacking fighters, having neither self sealing fuel tanks nor sufficient defensive armament. In particular, while the aircraft's nose and tail turrets protected against attacks from the front and rear, the Wellington had no defences against attacks from the beam and above, as it had not been believed that such attacks were possible owing to the high speed of aircraft involved. As a consequence, Wellingtons were switched to night operations and participated in the first night raid on Berlin on 25 August 1940. In the first 1,000-aircraft raid on Cologne, on 30 May 1942, 599 out of 1,046 aircraft were Wellingtons (101 of them were flown by Polish aircrew). With Bomber Command, Wellingtons flew 47,409 operations, dropped 41,823 tons (37,941 tonnes) of bombs and lost 1,332 aircraft in action. Coastal Command Wellingtons carried out anti-submarine duties and sank their first enemy vessel on 6 July 1942. DWI versions (see below) fitted with a 48 ft (14.63 m) diameter metal hoop were used for exploding enemy mines by generating a powerful magnetic field as it passed over them. In 1944, Wellingtons of Coastal Command were deployed to Greece, and performed various support duties during the RAF involvement in the Greek Civil War. A few Wellingtons were operated by the Hellenic Air Force. While the Wellington was superseded in the European Theatre, it remained in operational service for much of the war in the Middle East, and in 1942, Wellingtons based in India became the RAF's first long-range bomber operating in the Far East. It was particularly effective with the South African Air Force in North Africa. This versatile aircraft also served in anti-submarine duties with 26 Squadron SAAF based in Takoradi, Gold Coast (now known as Ghana). In late 1944, a radar-equipped Wellington was modified for use by the RAF's Fighter Interception Unit as what would now be described as an Airborne Early Warning and Control aircraft. It operated at an altitude of some 4,000 ft (1,219 m) over the North Sea to control de Havilland Mosquito fighters intercepting Heinkel He 111 bombers flying from Dutch airbases and carrying out airborne launches of the V-1 flying bomb. The Wellington is listed in the appendix to the novel KG 200 as one flown by the German secret operations unit KG 200, which also tested, evaluated and sometimes clandestinely operated captured enemy aircraft during World War II. 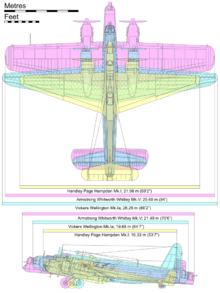 Picture - Scale comparison diagram of the trio of British twin-engined medium bombers at the outbreak of World War II; the Wellington, the Handley Page Hampden and the Armstrong Whitworth Whitley. Type 271 The first Wellington bomber prototype. Type 285 Wellington Mark I One pre-production prototype. Powered by two Bristol Pegasus X radial piston engines. Type 290 Wellington Mark I The first production version. Powered by two 1,000 hp (750 kW) Bristol Pegasus XVIII radial piston engines. Fitted with Vickers gun turrets, 183 built at Weybridge and Chester. Type 408 Wellington Mark IA Production version built to B Mark II specifications with provision for either Pegasus or Rolls-Royce Merlin engines, although only the two 1,000 hp (750 kW) Pegasus XVIII engines were used in practice. Main landing gear moved forward 3 in (8 cm). Fitted with Nash & Thomson gun turrets. 187 built at Weybridge and Chester. Type 416 Wellington Mark IC The first main production variant was the Mark IC which added waist guns to the Mark IA. A total of 2,685 were produced. The Mark IC had a crew of six; a pilot, radio operator, navigator/bomb aimer, observer/nose gunner, tail gunner and waist gunner. 2,685 built at Weybridge, Chester and Blackpool. Type 406 Wellington Mark II The B Mark II was identical with the exception of the powerplant; using the 1,145 hp (855 kW) Rolls-Royce Merlin X engine instead. 400 were produced at Weybridge. Type 417 Wellington B Mark III The next significant variant was the B Mark III which featured the 1,375 hp (1,205 kW) Bristol Hercules III or XI engine and a four-gun tail turret, instead of two-gun. A total of 1,519 Mark IIIs were built and became mainstays of Bomber Command through 1941. 1,517 built at Chester and Blackpool. Type 424 Wellington B Mark IV The 220 B Mark IV Wellingtons used the 1,200 hp (900 kW) Pratt & Whitney Twin Wasp engine and were flown by two Polish squadrons. 220 built at Chester. Type 442 Wellington B Mark VI Pressurised with a long wingspan and 1,600 hp (1,190 kW) Merlin R6SM engines, 63 were produced and were operated by 109 Squadron and as Gee radio navigation trainers. 63 built at Weybridge. Type 440 Wellington B Mark X The most widely produced variant of which 3,804 were built. It was similar to the Mark III except for the 1,675 hp (1,250 kW) Hercules VI or XVI powerplant and a fuselage structure of light alloy, instead of steel. The Mark X was the basis for a number of Coastal Command versions. 3,803 built at Chester and Blackpool. Type 429 Wellington GR Mark VIII Mark IC conversion for Coastal Command service. Roles included reconnaissance, anti-submarine and anti-shipping attack. A Coastal Command Wimpy was the first aircraft to be fitted with the anti-submarine Leigh light. 307 built built at Weybridge, 58 fitted with the Leigh Light. Type 458 Wellington GR Mark XI Maritime version of B Mark X with an ordinary nose turret and mast radar ASV Mark II instead of chin radome, no waist guns, 180 built at Weybridge and Blackpool. Type 455 Wellington GR Mark XII Maritime version of B Mark X armed with torpedoes and with a chin radome housing the ASV Mark III radar, single nose machine gun, 58 built at Weybridge and Chester. Type 466 Wellington GR Mark XIII Maritime version of B Mark X with an ordinary nose turret and mast radar ASV Mark II instead of chin radome, no waist guns, 844 built Weybridge and Blackpool. Type 467 Wellington GR Mark XIV Maritime version of B Mark X with a chin radome housing the ASV Mark III radar and added RP-3 explosive rocket rails to the wings, 841 built at Weybridge, Chester and Blackpool. Wellington C Mark XV Service conversions of the Wellington Mark IA into unarmed transport aircraft. Able to carry up to 18 troops. Wellington C Mark XVI Service conversions of the Wellington Mark IC into unarmed transport aircraft. Able to carry up to 18 troops. Type 487 Wellington T Mark XVII Service conversions of the Wellington bomber into training aircraft with Air Intercept radar. Powered by two Bristol Hercules XVII radial piston engines. Type 490 Wellington T Mark XVIII Production version. Powered by two Bristol Hercules XVI radial piston engines. 80 built at Blackpool, plus some conversions. Wellington T Mark XIX Service conversions of the Wellington Mark X used for navigation training. Remained in use as a trainer until 1953. Type 619 Wellington T Mark X Postwar conversions of the Wellington Bomber into training aircraft by Boulton Paul in Wolverhampton. For navigation training the front turret was removed and replaced by a fairing and the interior re-equipped. Some were sold to France and Greece. Type 298 Wellington Mark II prototype One aircraft L4250. Powered by two 1,145 hp (854 kW) Rolls-Royce Merlin inline piston engines. Type 299 Wellington Mark III prototype. Two only. Type 410 Wellington Mark IV prototype. Serial R1220. Powered by two Pratt & Whitney Twin Wasp radial piston engines. Type 416 Wellington (II) The original Wellington II prototype was converted with the insstallation of a 40 mm (1.57 in) Vickers S gun in the dorsal position. Type 418 Wellington DWI Mark I Conversion of four Wellington Mark IAs to minesweeping aircraft. Fitted with Ford V-8 petrol engine and Maudsley electrical generator to induce magnetic field in a 48 ft (14.63 m) diameter loop mounted under fuselage. They had a solid nose with a bracket supporting the loop, which was also supported under the rear fuselage and the wings, outboard of the engines. DWI stood for Directional Wireless Installation - a cover story for the true purpose of the loop. Type 419 Wellington DWI Mark II DWI Mark I aircraft upgraded by installation of De Havilland Gipsy engine for increased generation power. At least 11 further aircraft converted to this standard. Type 407 and Type 421 Wellington Mark V Second and first prototypes respectively: Three were built, designed for pressurised, high-altitude operations using turbocharged Hercules VIII engines. Wellington Mark VI One high-altitude prototype only. Type 449 Wellington Mark VIG Production version of Type 431. Two aircraft only. Wellington Mark VII Single aircraft, built as a test-bed for the 40 mm Vickers S gun turret. Type 435 Wellington Mark IC Conversion of one Wellington to test Turbinlite. Type 437 Wellington Mark IX One Mark IC conversion for troop transport. Type 439 Wellington Mark II One Wellington Mark II was converted with the installation of a 40 mm Vickers S gun in the nose. Type 443 Wellington Mark V One Wellington was used to test the Bristol Hercules VIII engine. Type 445 Wellington (I) One Wellington was used to test the Whittle W2B/23 turbojet engine, the engine was fitted in the tail of the aircraft. Type 454 and Type 459 Wellington Mark IX Prototypes with ASV Mark II, ASV Mark III radars, and powered by two Bristol Hercules VI and XVI radial piston engines. Type 470 and Type 486 Wellington This designation covers two Wellington Mark II aircraft fitted with the Whittle W2B and W2/700 respectively. Type 478 Wellington Mark X One Wellington was used to test the Bristol Hercules 100 engine. Type 602 Wellington Mark X One Wellington was fitted with two Rolls-Royce Dart turboprop engines. Wellington Mark III One Wellington was used for glider tug, for glider clearance for Hadrian, Hotspur and Horsa gliders. There are two surviving complete Vickers Wellingtons; both are on display in the United Kingdom. Some other substantial parts also survive. Wellington Mark IA serial number N2980 is on display at Brooklands Museum at Brooklands, Surrey. This aircraft lost power during a training flight in 1940 and ditched in Loch Ness. All the occupants survived except the rear gunner, who was killed when his parachute failed to open. The aircraft was recovered from the bottom of Loch Ness in September 1985 and restored, the propellers remaining in their damaged state as a tribute to the gunner. Wellington T Mark X serial number MF628 is on display at the Royal Air Force Museum, London. It was delivered to RAF No.18 MU (Maintenance Unit) at RAF Tinwald Downs, Dumfries, as a Wellington Mark X, on 11 May 1944. In March 1948 the front gun turret was removed in its conversion to a T Mark X for its role as a trainer aircraft; however, the museum has refitted the front gun turret in keeping with its original build as a Mark X.
Andrews, C.F. 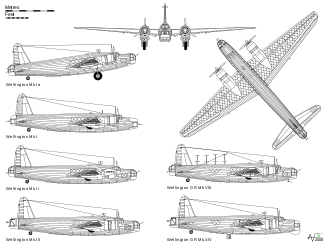 The Vickers Wellington I & II (Aircraft in Profile 125). Leatherhead, Surrey: Profile Publications Ltd., 1967. No ISBN. Flintham, V. Air Wars and Aircraft: A Detailed Record of Air Combat, 1945 to the Present. Facts on File. (1990) ISBN 0-8160-2356-5. Mackay, Ron. Wellington in Action, Aircraft Number 76. Carrollton, TX: Squadron/Signal Publications, Inc., 1986. ISBN 0-89747-183-0. Ovčx�čx�k, Michal and Susa, Karel. Vickers-Armstrongs Wellington Medium Bomber variants. Prague, Czech Republic: 4+ Publications, 2003. ISBN 80-902559-7-3. Richards, Denis. Royal Air Force 1939-1945:Volume I The Fight at Odds. London:HMSO, 1953. Richards, Denis. The Hardest Victory: RAF Bomber Command in the Second World War. London:Coronet Books, 1995. ISBN 0-340-61720-9.